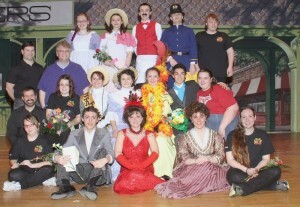 FULTON, NY – As Quirk’s Players of G. Ray Bodley High School presented their 2013 annual musical, “Hello, Dolly!” special recognition was bestowed upon the members of senior class who appeared in the cast, worked backstage on the tech crew and who played in the orchestra of this year’s production. Seniors were honored for their dedication and commitment to the theatre program at Bodley. Everyone in the “Quirk’s Players Family” extended a special thanks to the seniors and wished them the very best after graduation in June. Seniors pictured after the final curtain call of “Hello, Dolly!” are front row from left: Maranda Mattiaccio, Mitchell Lalik, Alexis Pawlewicz, Amanda Trombly and Maureen LaGrou. Second row from left: Quirk’s Players music director Mr. Thomas Nami, Devyn Viscome, Krista Vann, Mikaela Houck, Katelyn Caza, Yann Taddei and Christina Teetsel. Third row from left: Quirk’s Players assistant director Mr. Rob Lescarbeau and Quirk’s Players director Mr. Tom Briggs. Fourth row from left: Laura Perwitz, Danni Kline, Steven McDougall, Robbie Lagowski and Joe McDermott.